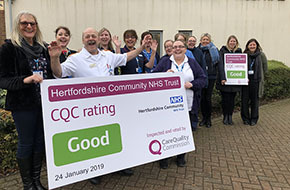 Services at Hertfordshire Community NHS Trust (HCT) have once again been rated as Good by the Care Quality Commission (CQC), the organisation which monitors, inspects and regulates health and social care services in England. The rating follows a planned inspection of HCT services in September 2018. A copy of the full report is available on the CQC website. The CQC rates services under five domains, determining whether services are safe, effective, caring, responsive and well led. Following its inspection in September 2018, the CQC rated HCT’s services as Good for being effective, caring, responsive and well led, but gave a rating of Requires improvement for safety. Inspectors also praised some of HCT’s specific innovations, including our initiative for healthcare assistants in our community nursing teams to administer insulin for stable diabetic patients with the support and management of registered nursing staff. This helps to ensure that registered nurses have more time to focus on patients with more complex needs. Clare said: “We recognise the areas where the CQC have told us that we need to make improvements and we are addressing the issues they raised with us, in particular making sure that we always manage medication and equipment correctly. Following the inspection, we took immediate actions to ensure that patient records are accurate, resuscitation equipment is always in place and that all equipment is regularly monitored, tested and maintained.